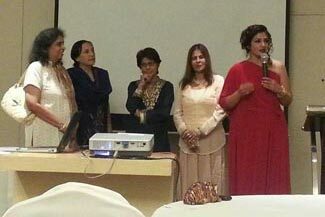 Our first fundraising dinner was held on Sunday, 17th November 2013 at the Mayfair Banquet Hall at Worli. The venue was beautiful and the event was very well attended by our supporters, both old and new. We had a wonderful group of people gathered together under one roof. 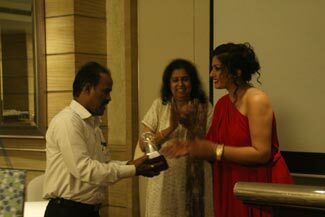 Our Guest of Honor Ms Raveena Tandon arrived on time, and enthralled us all with her enthusiasm for animal welfare. She spoke with such conviction about the need for kindness and compassion that it did the audience good to hear her. Mr Sunil & Mrs. Shaila Jhangiani of 'Chemistry' had sponsored this Event, as they have sponsored every event for our organization all these years. We were so happy that they could be with us on this festive occasion. Among all the wonderful animal supporters, we played host to the Consul General of Canada, Mr Richard Bale and his love wife Susan, both animal lovers. It was an honor to have Raveenaji and Mr. & Mrs. Bale amongst us. 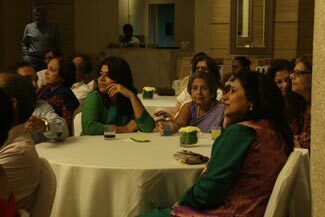 Our Managing Committee was there in full force; Sudnya Patkar our Founder / Hon. Secretary, Fizzah Shah President, Vivienne Choudhury Vice President, Goodicia Vaidya Past President, Dr Sangeeta Vengsarkar Shah Hon. Treasurer and Priya Grover our Managing Committee Member were present, but we missed others like Naina Athale, Aban Bhote, Sarita Raturi, Dr. H. G. Ghanawat, Dr. Makarand Chavan and Dr. Dinesh Vinherkar, who could not make it due to prior commitments. To start off proceedings, Fizzah Shah gave a warm welcome address to the gathering, following by the screening of the video about IDA India, made by Tunali Mukherjee and Nikhil Gonzalves. 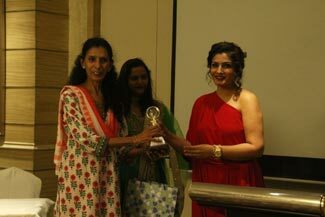 Then came the big moment when our three nominated Awardees were given the IDA India "Champion of Animals 2013" trophy by Ms. Raveena Tandon. The first, Mr Ajay Marathe has filed cases and used RTI for animal related issues. The most prominent case he fought was for his own pet dog, who was prevented by his Society from using the elevator. Ajay won, and this case has helped pet parents all over India to fight against anti-pet resolutions made by various Societies. Ajay filed a case in the Bombay High Court on behalf of a male man-eating tiger that was to be killed and he sought a ban on bullock cart races in Maharashtra. He provided free medical treatment to bullocks stationed at Sewri for delivery of kerosene oil, up to the time when the Government banned these carts. Ajay and his wife Nandini take care of numerous animals living in their vicinity and once rescued 5 kittens which had been dumped in their Society, from sure death. 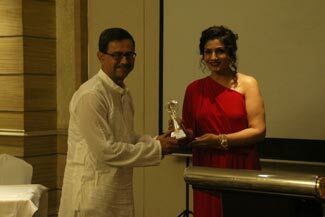 Our next Champion was the Messiah of all homeless animals, Ms Aban Mistry. Working In Indian Bank for over 25 years, Aban always finds time to help stray animals in distress. She receives calls every day and will rush to the rescue of an animal even in the middle of the night. She has faced tremendous pressure from her housing society and from neighbours for bringing home injured animals for treatment, homing them until they have recovered. She is indeed one of our Champion of Animals and we are proud of her efforts. Mr Samir Navrekar, our third winner, cares for the stray cattle in Powai. He knows each individual animal and has also understood that the cattle are divided into three herds. He keeps a strict watch over them as these animals on the road are vulnerable to abduction and illegal slaughter. Samir has done his best to see that they do not suffer this terrible fate. For one of the herds from the IIT Powai campus, he has negotiated and got them a safe sheltered place within the campus. This group now, instead of venturing out onto the dangerous roads to locate food, are given the Hostel kitchen waste as fodder which has proved to be good for them. For his untiring efforts on behalf of these animals, Samir richly deserves the title Champion of Animals. After giving our three winners their trophies and gift hampers, Dr Sangeeta Vengsarkar presented a Gift Hamper to Raveena Tandon in gratitude for her efforts on behalf of animals. Our Desk Calender for 2014 was ready and it was released by Raveena and is now available to the public. Vivienne Choudhury gave the Vote of Thanks. There were so many wonderful people to thank for helping us make this event such a success, including each of our guests, with special thanks for our hard-working volunteers, who we just could not have managed without. They need a special mention here as well. Our hearty thanks to Vasudha Samant, Priyasha Corrie, Thresa George and Prachi Rajaney. Special mention must also be made here of our Priya Grover, Managing Committee member who handled practically all the arrangements for this event. The evening came to an end with everyone enjoying the vegan dinner. The corner that was most popular was the "Chaat Station" and we were just so happy that everyone who came had a wonderful time, remembering at the same time, that their very presence showed how much they cared for animals and became a part of the festive evening for the benefit of the cause of animals. It was so enjoyable that we are now planning to make this an annual event. Each of our guests went home with a gift bag from our Sponsors, Sunil and Shaila Jhangiani of 'Chemistry' and a carefully prepared gift hamper from IDA India, that included the Table Calendar for 2014. The wonderful moments were clicked by a young photographer Aishwarya Kapkade, so we are grateful to her and to our wonderful supporter Tunali Mukherjee for arranging for her to cover the Event, which she did so well.